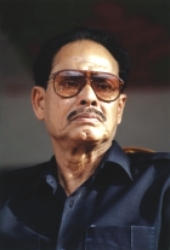 HM Ershad was thrown into the dustbin of history in a mass upsurge in 2000. The vile dictator's several attempts to come out of oblivion have proved to be a failure. Though his party has so far won quite a few seats in the National Parliament, Ershad has remained a joke in local politics. And it is a rather cruel joke indeed, for both the major political parties have made him the rope of their tug of war. Whenever any one of them needs some vote in the Northeast it takes Ershad into their fold only to dump him at a convenient moment. With the charges of corruption looming large, Ershad does not have an option either. The former General tries to put a brave face though, but everyone knows how the Bangladesh Nationalist Party and the Awami League have made him a commodity in their horse-trading. Jatiya Party (JP) has so far been split into numerous factions; people have lost track of them. Talking about Ershad or his corruption and misdeed is no longer the in-thing in Bangladeshi politics. Ershad is a convicted criminal; he went to jail and served sentences for corruption. Then why would news reports about his corruption irk his fellows in Gazipur and Magura, so much so that they would burn copies of newspapers? We are surprised on two counts. We never knew that Ershad has managed to have supporters in Gazipur and Magura; how few their number may be. JP leaders, reacting to the incident, said it was a ploy to tarnish Ershad's image. Ershad's image? They must be joking. Ershad has to be born a few hundred times more to make a good politician out of him. Burning newspapers will not help him anyway. It's time to get those mosquito nets and insect repellent creams out again as dengue spreads its lethal grip on the nation for the umpteenth time. And with the seriousness with which it is spreading, it's not good enough to just take care of the home front. Residents should make sure that water is not allowed to collect in puddles for too long in the neighbourhood they live in. It's surprising though that the Dhaka City Corporation (DCC) is not taking more hard-hitting steps to eradicate mosquitoes from the city. Although the DCC is said to be conducting vigorous anti-dengue campaign in different parts of the city many of the congested localities have not seen a DCC spray machine in months. The frightening characteristic about this season's dengue is that many of the patients have been affected with the haemorrhagic fever where blood clots appear in different parts of the body including the eyes. Dengue fever is more common in late July in our country and gradually increases its incidence for the next 2-3 months (the aedes mosquito breeds during the monsoon season). More than 500 people of all ages have already been hospitalised in different parts of the city suffering from Dengue Haemorrhagic Fever (DHF). The number is expected to rise rapidly and the only thing that can save the residents is their awareness. The recent unrest in the readymade garment sector has spurred the Commerce Minister Hafizuddin Ahmed to ask the owners to open fire in case of attacks on their factories. It seems that the minister is out to bluster his way out of the recent crisis, and in his attempts he has lost all sight of what is legally permissible and what is not. Without even realising the consequences, the minister called upon the garment factory owners to resort to extreme measures. It is a matter of grave concern that no one present at that meeting with the factory owners at Bangladesh Garment Manufacturers and Exporters Association (BGMEA) realised that his prescription is tantamount to taking the law in one's own hands. Following his call to open fire on attackers, the minister came up with his own rationale. “Sometimes you have to be tough. You can wait for one or two incidents and open fire on the attackers straight away to save your factory,” said the minister. It is interesting to note that in the same speech he urged the owners to try their best to raise the salary of the garment workers and implement the memorandum of understanding (MoU) signed at a tripartite meeting in June. “The owners should increase the workers' salary so that they can live a decent life,” he said. No tough words for the owners who have failed to meet the demands of the worker time and time again. What can be surmised from what has been said in the same meeting by former BGMEA president, Anisul Haq, is that many issues regarding payment of salaries of the workers are yet to be resolved. Haq claimed in his speech that the workers are demanding salary hike of an astronomical 525 percent and they are demanding Tk 24,425 a month for a grade-1 worker. If this is the case, one can safely say that the present situation has reached a deadlock. And the only prescription should be to summon the owners, the workers and their representative bodies to sit and talk to end the deadlock, if the commerce minister is willing to refer to it as such. Instead of urging the owners to resolve the crisis the minister has given them the verbal equivalent of a green light to take the law into their own hands. Since the bombings that rocked Lebanon, along with the locals, foreign nationals have been trying to flee to their home countries or to nearby areas safe enough to live in temporarily. Most of them were taken first by boat to Larnaca in Cyprus, from where they are being flown to their respective countries. Many of the South Asian nationals in Lebanon are unskilled or semi-skilled labourers working in factories, industrial units or as domestic staff. Many of them have been living in Lebanon for more than two decades. An estimated 10,500 Indians and 90,000 Sri Lankans remain in Lebanon. The International Organisation for Migration, responding to an appeal by the Sri Lankan government, took 270 Sri Lankan citizens out of Lebanon in two convoys on Thursday and Friday. Bangladesh has also asked for help locating and evacuating an estimated 10,000 nationals stranded in the country from conflict-stricken Lebanon. According to Zahirul Haque, the foreign office spokesman, the Bangladeshis will travel to Damascus with help from the Geneva-based International Organisation for Migration. An estimated number of 10,179 Bangladeshis live in Lebanon. Most are migrant workers engaged in construction, hotels and textile sectors.